"Central to Their Lives," organized by the Johnson Collection, Spartanburg, South Carolina, examines the achievements of women artists working in and inspired by the American South. Spanning the decades between the late 1890s and early 1960s, it looks at the particularly complex challenges these artists confronted in a traditionally conservative region during a period in which women’s social, cultural and political roles were being redefined and reinterpreted. How did the variables of historical gender norms, educational barriers, race, regionalism, sisterhood, suffrage and modernism mitigate and motivate women seeking expression on canvas or in clay? Working from studio space in spare rooms at home or on the world stage, the artists considered made remarkable contributions by fostering future generations of artists through instruction, incorporating new aesthetics into the fine arts and challenging the status quo. This exhibition includes works by Minnie Evans, Anne Goldthwaite, Clementine Hunter, Nell Choate Jones, Ella Sophonisba Hergesheimer, Alma Thomas, Mary Leath Thomas, Elizabeth O'Neill Verner and Kate Freeman Clark, in sculpture, drawing and painting. The museum is open Tuesday, Wednesday, Friday and Saturday from 10 a.m. to 5 p.m., Thursday from 10 a.m. to 9 p.m., and Sunday from 1 to 5 p.m. (closed Monday). 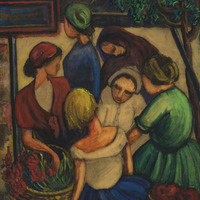 This exhibition is sponsored by the W. Newton Morris Charitable Foundation and the Friends of the Georgia Museum of Art.